what are the expectations regarding showing initial research on a question? I think to really answer this question, we have to be able to answer what is too basic. But even for basic and advanced questions, there are varying levels of showing initial research. Basic: If a question can be easily answered by a quick google search, wikipedia, or an introductory textbook in psychology, then the person has not shown initial research on a question. Advanced: If a person cites a specific paper or result, and the paper clearly answers the question then the person has not shown initial research. Unless they make it explicit they are fully aware of the content of the paper but are struggling with it. There seems to be a knee-jerk reaction to "easy" questions that involves quickly answering by copying/pasting an embarrassing link to lmgtfy.com (or similar responses in comments, which aren't downvotable) in an attempt to belittle the questions' authors. I think this comes from engagement in forums, where people would ask simple questions like "What is a variable?" We’ve seen it come up enough times now that I’m comfortable making a final decision: yes, some questions are too simple to be answered … at least on our sites. Not because they’re bad questions, mind you, but because these types of questions can be definitively and permanently answered by a single link to a standard internet reference site with no additional explanation necessary. We discourage “answers” that are links, but for these questions, it’s hard to argue that anything else is required. It is worthwhile noting that the exact rules are up to each individual StackExchange community to determine. Just because other communities adopt certain rules, we don't have to adopt them either. 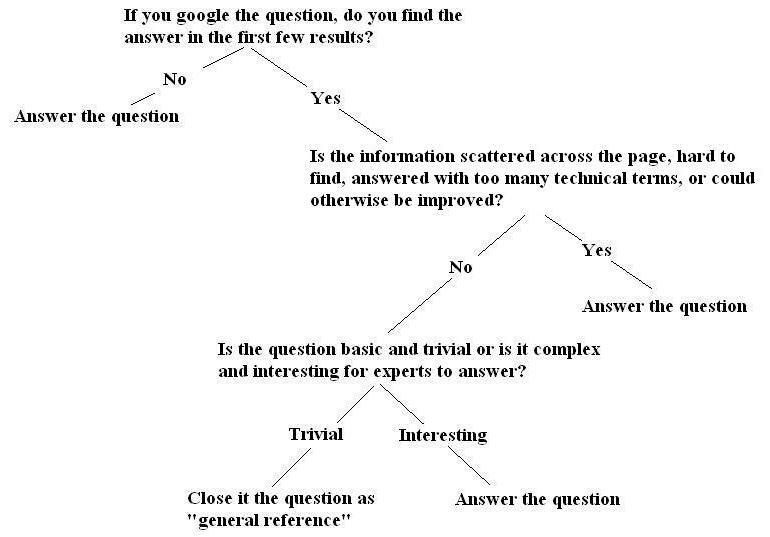 But the general consensus seems to be that easy questions are generally allowed, unless it they are "general reference" questions and also not interesting questions to answer. We somewhat established non-experts are welcomed here. Of course there is a good chance that 'consensus' mainly originated from this site having more non-experts than experts. This is really difficult to analyze. In its current form this site is trying to be open to experts and non-experts alike. Does the presence of the non-experts drive away the experts? If this would be true, eventually we would only have non-experts on the site, and nobody is left to answer questions correctly. That would be bad. However, as long as the community is able to distinguish between bad and good posts, which is something we all can do, I don't see a real problem. We might have a limited amount of experts at first, but we are still growing. If we were to decide only professional initial research would constitute good initial research, we would scare away all the non-professionals and we would have a considerable smaller user base. I feel it is more important to have an active site with valid content (professional or not), than to have an inactive site with solely professional content. Wouldn't an inactive site drive away professionals just as well? As long as we can prevent inaccurate posts from filling up the site, we should be fine. In line with the points I raised earlier: I feel we shouldn't hold up every question to the same standards. What I am about to say is very much in line with the FAQ. Mainly the following two points which I've noticed tend to be a problem with the questions being closed on this site. Initial research should resolve this issue. It should be clear there is an actual problem. What is it that you don't understand, and how would an answer to your question help you? Just stating facts and asking an open-ended question (or no question at all) isn't answerable. You could give tons of relevant information, but that is not a good fit for Q&A. This is our main problem. We should make it very clear that although non-expert questions are welcome, we shouldn't allow questions which aren't founded in any way. Even non-expert questions shouldn't be hypothetical. Stating you heard something once, but don't recall when or where doesn't constitute a good question. Non-expert and expert questions alike should show proof there is reason to ask the question. The difference lies in what proof. If a non-expert can link to dozens of articles/forum-posts/TED talks and the like, there is reason to believe his question is founded. There is nothing wrong with being skeptical and asking for more scientific resources. They usually don't expect a very broad answer, just a push in the right direction so they can attempt to look into it themselves. This will guide them into self-learning and being able to ask a more professional question on the topic the next time around. This leads me to a tip for those answering questions with non-professional initial research. Don't answer them as if it is a professional question. Just point them in the right direction. My guess is it constitutes a good answer just as much as a more extensive answer would. Save your time for the more detailed questions. I added a few opinions about prior research here. I just thought I'd quote them here given that this seems to be the central storage place of initial research requirement discussions. If such a question was answered, would it improve the Internet? If the question is easy to answer, then someone will probably add an answer, and that will be the end of it. I think it's much more important that answers are held up to standards of scientific rigour. For questions it's more important that they are answerable and interesting. Not the answer you're looking for? Browse other questions tagged discussion research .